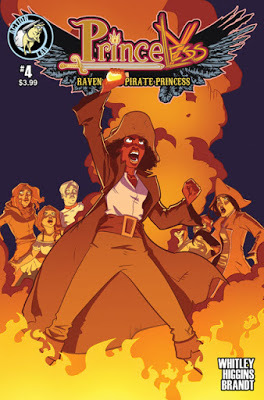 'Princeless: Raven, the Pirate Princess' #4 is the prelude to some high sea adventure but first Raven and her crew have to make it out of town in one piece. Cookie and Jayla are held up in the tavern with a mob at the door looking for the "witch" and it's up to Ximena to save the day. There's a good amount of action and ingenuity, but it's the emotional ties that are the glue of the story. Jeremy Whitley is in no hurry to get to the next set piece, the next big action scene or comedic situation. Instead, Whitley loves his characters, specifically Raven and Ximena, and their time together, their interactions are what's important. Four pages of dialogue between two characters are virtually unheard of in today's comics because there usually isn't a high importance placed on developing characters thoroughly. But that's how 'Raven' opens up. Ximena and Raven stare up at a starry sky and the scene develops like a stream of molasses and every bit as sweet. Ximena describes a pair of stars who draw close and separate intermittently over time. It's a lesson in astronomy on its surface but also a metaphor for their relationship. Raven seems distracted and what is left unsaid becomes as important as what was said. It's a bonding moment filled with sweet parallels and playful interaction. The rest of the issue is lighthearted with a clever ruse from Ximena to deceive the Kingsmen at Cookie's door and the rallying of Raven's crew. Cookie realizes Jayla has outgrown this town of pirates and is capable of so much more. Another instance where the value of a relationship is explored and brought to the fore. Rosy Higgins and Ted Brandt do a remarkable job of creating a warm mood with darker hues without relying on shadows or heavy inking. The pacing of scenes is deliberate and in keeping with the slow burn of the exposition. Higgins is a master of evoking so much emotion from various facial expressions. Whitley has made 'Raven, the Pirate Princess' a special read where character, emotion, and relationships matter. The final pieces are in place after a funny and emotional journey to get to this point. Thanks to Higgins and Brandt the future of this seafaring adventure is looking good.